The U.S. Fish and Wildlife Service has proposed North Carolina's newest national wildlife refuge, a 23,000-acre sprawl protecting some of the nation's rarest habitats, Southern Appalachian bogs. Small bogs are scattered across the mountains. They're often not part of other wetlands, but serve some of the same functions, absorbing floodwaters like sponges and slowly releasing the water. 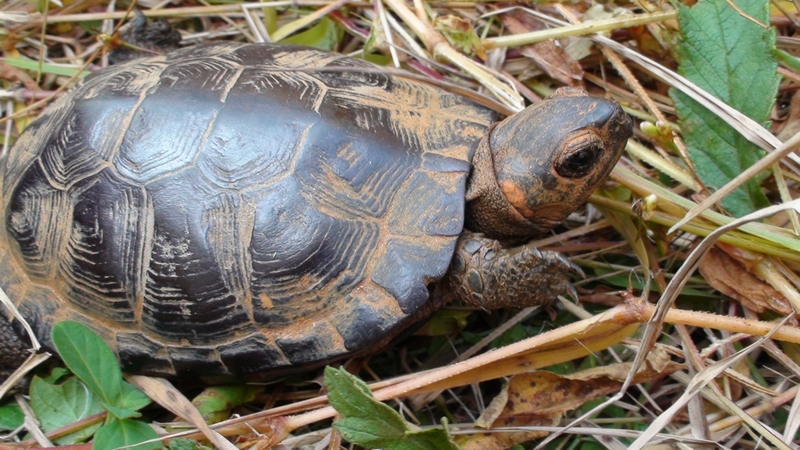 Five endangered species, including the little bog turtle (above), depend on them. Migratory birds and game animals like turkey and mink forage among them. The proposal, which needs approval by the Fish and Wildlife director, takes a different approach from most federal refuges. It would be scattered across up to 30 different sites in 11 western North Carolina counties. And at least part of it would be held through easements or leases instead if outright purchases. As always, the plan hinges on whether money is available and landowners willing to protect their land. The Nature Conservancy is among the groups that have already worked for years to protect some bogs, giving the proposal a head start. The wildlife service will spend the next year soliciting public reaction and evaluating the proposal before sending the findings to Washington in 2013. Written comments are being taken now and information sessions will be held in Hendersonville, West Jefferson, Franklin and Boone. North Carolina has 10 national wildlife refuges covering nearly 420,000 acres. Only one, Pee Dee in Anson and Richmond counties, is in the western half of the state. The N.C. Utilities Commission has set a fast schedule for reviewing the federal approval of the Duke Energy-Progress Energy merger. The Federal Energy Regulatory Commission attached new conditions in approving the $26 billion merger last Friday. Now the state commission wants to assess the FERC order's impact on North Carolina customers, including merger terms agreed to by the utilities and the commission's Public Staff, which represents consumers. A commission order says Duke, Progress and the Public Staff have until Wednesday to file comments or testimony on the impact of the federal order. Formal parties to the merger case, such as customer groups, have to file comments and respond to the utilities' position by Monday. The utilities and Public Staff have until next Tuesday to issue rebuttals. Duke and Progress, meanwhile, have 15 days following Friday's federal order to indicated their acceptance of the new conditions. The companies have targeted a July 1 closing, but have a week beyond that to seal the merger or potentially abandon it.